The recent global financial crisis is viewed as a glaring example of limitless pursuit of deregulation of financial markets and failure of global corporate governance. Though the global economic slowdown had its epicenter in the US but its impact is being witnessed in all major economies of the world. The present chapter seeks to analyze the post crisis experience of the Indian economy as compared to the global economic performances, using various macroeconomic indicators as output, employment, inflation, current account balance, movement in real effective exchange rate and inflow of FDI. It is based on a statistical analysis using secondary time-series data and is based on the Exogenous Structural Break Model developed by Perron (1989). Finally it tries to highlight the confidence of the economic agents based on some well recognized confidence indices (for e.g. 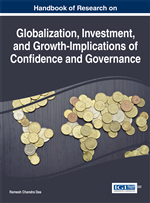 Business Confidence Index, Consumer Confidence Index, FDI Confidence Index etc.) during the post-crisis period. Financial crises and accompanying economic recessions have occurred throughout history and it is a form of the normal business cycle. The crisis may be a traumatic or stressful change in, political, social, economic, military affairs and large-scale environmental event. The origin may be different but the tremors are being felt in different parts of the world. Globalization, which, has contributed to the extraordinary accumulation of wealth and finance overtime, is usually the leading force in the growth of globalization. Financial globalization contributed to the unprecedented growth and prosperity on the one hand but has also resulted in greater instability through excessive use of credit, lowering of credit standards, and heavy reliance on leverage due to poor governance. The recent economic crisis is widely viewed as a glaring example of limitless pursuit of deregulation of financial markets and failure of global corporate governance at the expense of caution, prudence, due diligence and regulation. After the collapse of the Bretton Woods Order, finance capital was increasingly operating under freely floating exchange rate. In developed capitalist world, all restrictions on movement of capital were gradually withdrawn. With full capital account convertibility of international currencies, there was a perceptible change in the functioning of the financial institutions. By early 1990s the new feature of “Sucking in Finance from all over the Globe and investing in all over the Globe” (Patnaik, 2009) became the order of the day. The origin of current economic crisis can be traced back to mid 2007, when three things became surfaced: (a) low income or sub-prime US households had borrowed heavily from banks and financial companies to buy homes; (b) the size of this sub-prime housing loan market was huge at about $ 1.4 trillion and (c) these loans had been packaged by the Wall Street financial engineers to really complicated financial instruments. In U.S.A., between 2001 and 2006, the interest rate prevailing in various sectors were low. Prices of houses showed an increasing trend because of lower rate of interest and banking sector was incurring lower profit. Therefore the banks and financial institutions in USA revised their lending rates, in which high rates of interests were charged and loans were given to the sub-prime lenders for purchasing the houses. They were fully aware about the risk involved in sub-prime lending for housing but they have taken such risk on the belief that housing prices would never fall. Investment in housing sector was found to be profitable to the speculators as well as banks, due to the continuously rising prices of houses. Americans have made huge speculative investment in housing sector. It caused a rise in demand for houses and housing loans in US. In order to fulfill the demand for huge loans for housing, the funds available with banks and financial institutions were found insufficient. Therefore, American banks and financial institutions introduced a new credit weapon called Mortgage Bonds. The basis of these mortgage bonds was the houses already mortgaged by the people for borrowing housing loans were again mortgaged by artificially increasing the price of houses more than their actual prices. These mortgage bonds were sold in international market. Large amounts of funds were collected by American banks by selling these mortgage bonds. These funds were utilized for financing the housing loans in US. This housing bubble based on sub-prime loans burst in 2006-07. In the same year housing prices had declined after 15-16 years. It adversely affected the speculative investment made in housing sector. Those who had invested in houses to earn more profit, have to face losses. Therefore, they started to sell the houses but due to lack of demand, houses could not be sold. Huge over dues of housing loans were not repaid by the borrowers. Banks and financial institutions did not succeed in the recovery of these loans. The price of mortgage bonds started a steep fall resulting in loss for those who invested in mortgage bonds. Hence, the liquidity problem in America became very serious. Meltdown set in the third quarter of the year 2007. The large banks like Lehman Brothers, Merrill Synch had declared bankrupt. In USA, 19 large banks and 100 private financial institutions were declared bankrupt. Thus, the default in mortgage loans for housing is the primary reason for the financial crisis sweeping the world.